Update 11/17/12: Palmyra is (temporarily?) closed. JM ate the chicken schawarma with a lemonade. 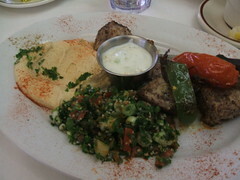 Miranda and Nichole each ate the sumac tuna kebab with hot mint tea. Phil ate the vegetarian platter #2 with an Arabic coffee. We and the kids shared the vegetarian platter #1, some labneh, muhammara, baklava, and a lemon bar. The bill was about $14/person, plus tip. Miranda, Nichole, and Phil gave Palmyra an A; JM gave Palmyra an A- (see our grading rubric). Palmyra is a friendly spinoff of Shish Cafe, and it's fantastic. It's more casual - it lacks the "feasts" that we'd so enjoyed last time, that were so handy for providing a balanced cross-section of almost everything they had to offer - but we'd be back in a flash. The host was very engaged and engaging. Before we left, he told us of Palmyra's plans to delve deeper into the traditional cuisine of the Levant with theme dinners, specifically mentioning desert foods that predate electricity. We're looking forward to that (especially Nichole, who had just finished reading the wonderful book Day of Honey and had learned just enough about Middle Eastern cuisine to be a real PITA* and use words like "Levantine"). The menu makes it easy to fill up your table with lots of small dishes of deliciousness. 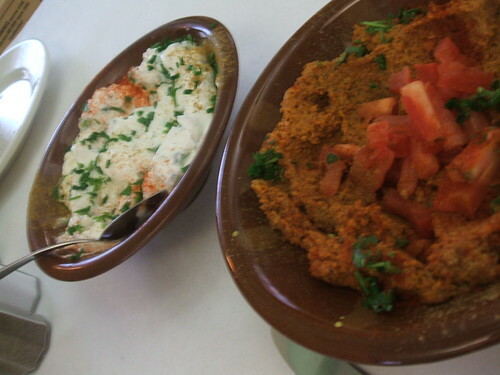 The labneh, or strained sour yogurt, was spiked with onion, cumin, and sumac. The clay-red mouhamara had a grainy, oily texture but ground walnuts and red peppers topped with tomatoes and parsley is always so good. The hummus here is heavy on the sesame oil and exquisitely smooth. One glitch was that the bread baskets didn't come out often enough for us to shovel all the tempting spreads into our faces as fast as we would have liked, and the pitas** were also not quite as fresh and supple as Shish's. JM's chicken schawarma was quite as expected and disappeared right on schedule. He maybe would have liked it a little juicier and the sides maybe could have been a bit more flavorful... but even then these are mostly complaints you'd have set aside by deciding to visit Palmyra, not with the meal itself. The sumac tuna was all we'd hoped for. The citrus bolt of ruby-red sumac powder was a perfect complement to the meaty fish. The filet was perhaps a little bit overdone, and kind of dry, but the yogurt dip, moist roasted tomatoes and green peppers helped. 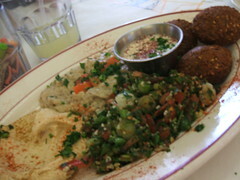 The two vegetarian sampler plates offered more mouhamara, hummus, and piles of fresh green tabbouleh. 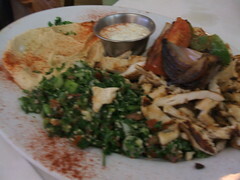 The babaganoush, Phil's test of a Middle Eastern restaurant's veracity, was a true flirt and earned a double-thumbs up with its lightly smoky flavor. 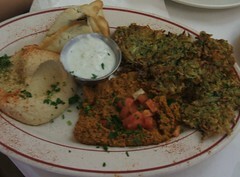 A new dish to us all was the "iggie": fried patties of shredded eggplant and green vegetables. They vanished before our eyes, far too fast for us to analyze properly. A few words about their falafel: it was crisp, perfectly oval, and more homogenous and finely chopped than, say, Banzo's. Still pretty awesome. We were in such a banqueting mood that dessert seemed apt. Sadly for us they'd had a run on desserts the night before, and were out of everything but baklava and lemon bars. 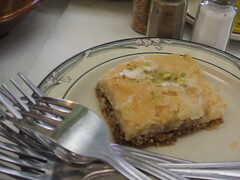 The baklava was perfect: flaky and honeyed but not soggy. 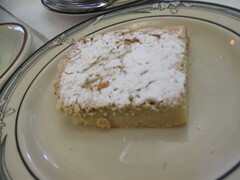 The base of the lemon bar seemed to be made with tahini, which was a great twist. They also serve other classics, like kebabs and the region's answer to day-old bread, fattoush, a mixed greens salad with toasted pita and olive oil. We'll be back. On a side note... this may be kind of silly... how is Palmyra pronounced? In a Roman history course I took years ago the professor pronounced it(the ancient city) "Pal-meer-a", but from what I've heard from residents of Jefferson county, when referring to the nearby town it's always "Pal-my-ra". Is that just a local Wisconsin thing, like the town Oregon? the owner pronounces it like they did in your history course (I guess he's the owner - or the manager, maybe?) - but I've heard most people who've talked about it pronounce it like the Wisconsin city. Tried to go here last night based on this review. We were the only ones in the place and had to wait to get seated, wait for menus and then were left at the table for 15 minutes with no service. Needless to say, we left. When the staff realized we were leaving, suddenly they were interested in us. I'll never go here again. Bummer cuz it sounds yummy. Been a couple times now and have always had wonderful service and never had a delay on the bread. I especially like the iggie and the lemon bar. The iggie is shredded summer squash, battered and fried. The lemon bar was coated in honey, like a lemon baklava. Both seem unique to Palmyra. Their dolma are some of the best I've ever had, super fresh. Yum!